On chrome (Version 39.0.2171.71 m) I have an issue with all (bootstrap-based) modals. Let me clarify: I am not building a website, I just have trouble with viewing some sites where they have a hide class. Like in a bootstrap modal with class="modal hide fade in", here it should display the modal (because it is faded in), but chrome's user stylesheet actually overwrites the CSS of bootstrap's hide class. 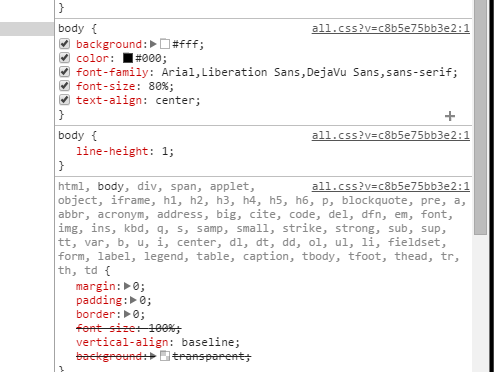 There are two methods to over-riding a subsequent stylesheet. By editing the stylesheet of that extension (or removing the extension completely) this issue is fixed. So basically I dislike the way how chrome displays this in de styles-sidebar of the developer tools, it showed it as user stylesheet instead of pointing to the stylesheet of the extension. Thanks for the answers anyhow. Not the answer you're looking for? Browse other questions tagged css google-chrome or ask your own question. What's the best way to override a user agent CSS stylesheet rule that gives unordered-lists a 1em margin?